An Amazing 4th Annual Uptown Ladies Night! 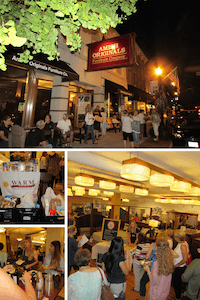 Thanks to everyone who joined us at this year’s Uptown Ladies Night Out! We had a record number of attendees—even a bachelorette party! —and food, fun, and fellowship were shared by all. We are also grateful for the donations to WARM’s food pantry; at the end of the evening, we had collected 342 pounds of food for this outstanding agency. 8 State Bistro, Asterisk Supper Club, Shirley’s Gourmet Popcorn Company, Koble Grill, A Twist on Olives, Rising Son Cafe/Zen Kidz Play Cafe, The Blue Turtle Tea & Spice Co. at Uptown on Main, and LuLu’s Sweet Shop. AND…mark your calendars for Thursday, September 21, 2017, for our fifth annual celebration!